I’m at the Sea Otter Festival in Monterey California this week, where I saw the GT Aerostream cruiser bike. As you can see in this photo, this bike has a 3 speed hub, fenders, chainguard, and 700 x 47 “city” tires. The women’s step through model comes with the front basket; the men’s model has a rear rack and comes with small panniers. The Aerostream kind of has the beach cruiser look, but the relatively stiff and lightweight aluminum frame gives this bike a much nicer ride than most beach cruisers I’ve tried. It doesn’t feel like I’m pulling a boat anchor when I ride this bike. One of the more interesting features, though: The GT Aerostream uses the Gates carbon belt drive instead of a chain. Overall a very nice ride and a nice looking bike. There’s a bike in that picture? Mmmmmmm! Mmm! What a stunning cutie! The bike looks nice too. I wonder if the front basket style bicycle is going to take off in America. It’s the prevalent style here in Japan. It is very convenient to see what you are carrying. This is awesome! I saw several belt driven bikes this year. Only saw one last year. How much nay would a naysayer say if a naysayer could say nay? Yes, but you have to have a frame that will accept the belt system. It’s hard to tell from that frame, but usually the frame separates at seat and chain stays or some others have a sliding dropout that you can remove from the frame to get the belt past the stays. Check out http://www.spotbikes.com/ for some pics of what I’m talking about. Also, I think spot sells a retro fit kit, but you have to the right type of frame for it to work. Separating the frame it this spot seems like it might become an issue as time and wear do their thing. Also what does this do to the frames’ “feel”? I’m not about to jump into this technology till its fully tested over a long period of time. Why doesn’t someone concentrate on perfecting the “breakable belt”, instead of “breaking” the frame???? 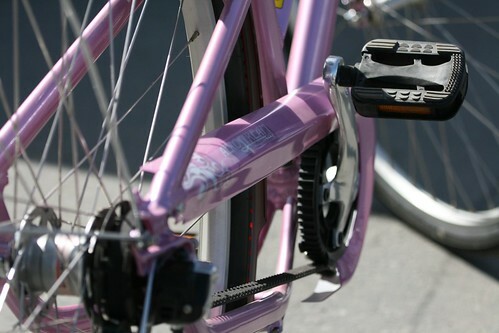 Imagine the revolution that would ensue if you could retrofit your chain-driven bike with a belt? APRIL 18 was the last blog post here. What’s going on? Is someone on vacation? If you notice in the bottom foto (the one without the attractive young lady) … they built the frame down lower to go around the belt … so it just slides thru with no problems. Instead of having to “break” the belt or “break” the frame. Back to the “breakable belt”. These belts are supposedly made of kevlar, and therefore should be able to accommodate steel rods and connecting plates on the side (much like a chain link works). It could even utilize something similar to a quicklink. WHY NOT? I’ve heard rumors Commute By Bike’s days are numbered. This may be a sign it’s comming sooner rather than later.. I offered to help CBB, but haven’t heard back. Waaa! First Yehuda, and now this! I have to agree that the days are numbered for CBB. This is bike to work Month and we’ve got nothing new out of this site…..something has to be going on. I hope that CBB does not go under. When I was having real trouble with the law and many motorists this site helped me understand so much. I also know that I am not the only one, nor the last one to need the support while commuting on unfriendly streets. I forgot to add, I hope and oil or car company didn’t buy this site! Any word on what’s going on? Is anyone out there? Still no response from the CBB owner. It’s run by the guy who runs twentynineinches.com , which fell under the Crooked Gog Network. CBB was in the Crooked Gog Network also. He’s going to consolidate all the Crooked Gog Network type stuff over at thecyclistsite.com . Will be nice to have it all in one place..
I’m contributing commuter and general bike content over there.. Sorry, I’m outta here… You know this place is in trouble when the shoe vendors start movin in….next will be the Viagra dealers… Time to go …Peace to all, hope to catch you elsewhere…. Now if only more manufactures used the belt drive with an 8 speed hub. Perfect combination for winter commuting. Low maintenance in bad conditions. ah! Just rembered about the “Subscription Manager” I’m out.. I need to ask why? Is a belt lighter? Can you shift it like a conventional chain? Is it cheaper? And what’s all this problem about maintenance; maintaining a chain is not hard. I personally like EXTERNAL gears, you have a bigger selection of them for any given terrain and you can obtain a wider ratio for variable terrain. When Astana outfits all its bikes with a belt I MIGHT think about converting. *L* until then it ranks up there with the elliptical chain ring!!! I just got one of these bikes yesterday and I can’t stay off of it. It’s great for city streets. It’s very lightweight but feels smooth and solid. The three speeds are distinct enough for hills and the straight away. Obviously, not very fast but if you want a good, lightweight ride around town and a bike that has nice response, I’d highly recommend this one. Seriously, I’m glad I got it and I’m coming off a Trek. No, the Carbon Drive Gates belt system requires a bike frame that breaks (opens) to allow the insertion of the belt. There also must be a tensioning adjustment method, like a screw. Final Day of our BIG Burley Sale!